Where in Wanganui could you participate in the construction of a large pumpkin for the Christmas parade, bird feeders, trolleys, or a hangman’s platform for a local theatre production? The Men’s Shed Wanganui Inc. is one of Wanganui’s most heart-warming and successful initiatives. When you enter the bustling shed you can see anything from a wooden painted car being constructed for Amdram’s ‘Wind in the Willows’ production, flat deck trolleys for the Sarjeant Gallery, or a revolving bookcase for a local theatre. Also under production could be the upholstering of furniture, a Wendy house, or a book trolley for the hospital. The Men’s Shed is a not for profit group that provides a facility for people with practical skills who are not in current employment. It is a place where they can utilise their skills on charitable community focussed projects. The members are mainly retired people from a variety of backgrounds including engineering, carpentry, upholstery, painting and administration. They say that the most valuable aspect is the companionship and friendships built while working together towards a common purpose. They also enjoy sharing ideas and problem-solving for the benefit of others. In June 2010 friends George Bowers (ex Chairman now deceased) and Barry Boardman thought it would be a good idea to set up a Men’s Shed in Wanganui after hearing about sheds operating in Australia. Subsequently they discovered that a number of Men’s Sheds had already been opened across New Zealand. Wanganui was the 13th Men’s Shed in New Zealand and there are now approximately 45 Sheds operating throughout the country. In July 2010, after advertising in the local press, 27 interested people met and voted to form a local Shed. After meeting legal requirements, applying for funding, and gathering equipment, a suitable building was found at the former UCOL campus off Wicksteed Street and since May 2012 the Men’s Shed has been operating from this site. The Wanganui Men’s Shed currently has 104 members, including a small number of women, ranging in age from 30-85 years. They operate on Tuesdays and Thursdays from 9am-3pm and average about 20 members per session. The materials and equipment is supplied from a variety of sources: from Lotteries funding, the former Wanganui Community Foundation, deceased estates, and generous bequests and donations. 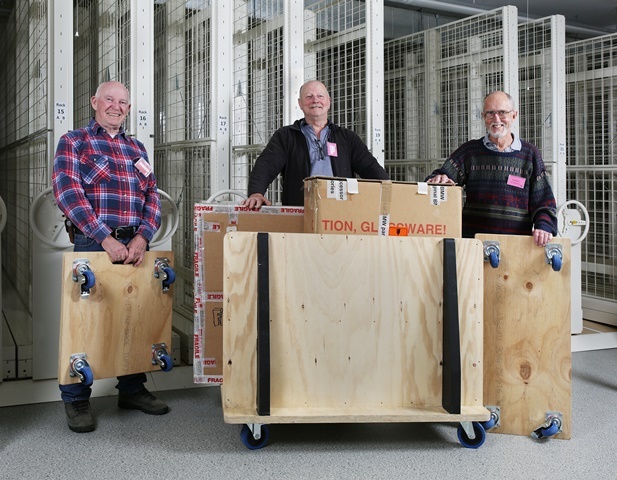 Recently the Men’s Shed made a significant contribution towards the Sarjeant Gallery redevelopment project by constructing a variety of trolleys and other equipment including a trolley for carrying paintings and flat deck trolleys for moving sculptures and three dimensional artwork for which we are very grateful. If you wish to contribute towards the Men’s Shed or discuss joining you can contact the Men’s Shed secretary Peter Smith c/- Age Concern PO Box 703 or alternatively pop in to the Shed at 292 Wicksteed Street, opposite the Central Baptist Church carpark, between 9am – 3pm on a Tuesday or Thursday. They will be delighted to meet you.